World Poker Tour Gardens Poker Championship ended on Tuesday inside Luxor in Las Vegas at the HyperX Esports Arena. 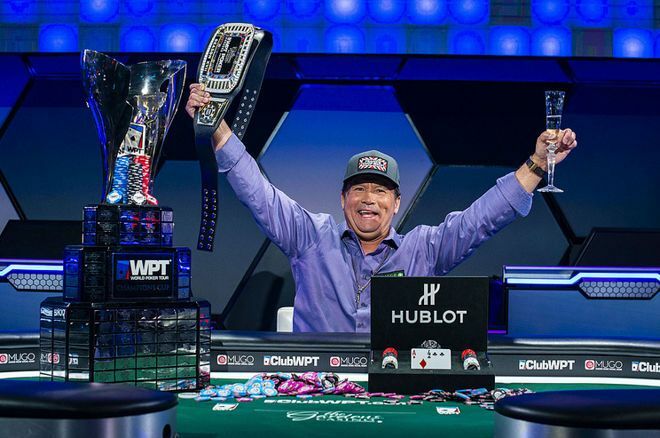 This was the second WPT final table that took place here over the course of three days, and the second WPT winner was decided. The winner of the event was an eccentric poker player called Frank “The Tank” Stepuchin, who was ready to win the tournament before it even began, claiming that he was not boasting and that he was just being positive that he was going to win. He also added before the tournament that the game was going to be a lot of fun, win or lose. What’s interesting is that Stepuchin had a very unusual lucky item which he held during the final table. This item was a simple chicken wing on a fork that he held throughout the play, and it turned out to be lucky for him indeed, as he managed to win first place and the prize of $548,825. Apart from the first-place prize, he also managed to win a Hublot Big Bang Steel Watch and a seat for Baccarat Crytal WPT Tournament of Champions, which is worth $15,000. Casually drinking Coors Light, he managed to win his way to the title as he battled his way through the final table. The best thing about Frank Stepuchin is that he is 59 years old! He said that people oftentimes thought he was just a guy who had passed middle age and liked to drink beers. Therefore, according to Stepuchin, people thought that he didn’t really care about anything and didn’t pay attention, but that they were wrong. Stepuchin talked about his poker biography a bit and stated that he had started playing bigger tournaments two years ago instead of playing $125 daily evens at the ARIA. Finally, he added that he would try not to have cold beverages in the future, but that it turned out that ‘poker gods’ always wanted him to consume cold beverages while playing poker. A total of six players took part in the final table, and Shannon Shorr was the main opponent to Stepuchin in the heads-up play. Shorr ended up second with a cash prize of $355,885. The third place was reserved for Steve Sung from South Korea, who managed to win a total of $259,880, while fourth place was occupied by Brent Roberts, who won $192,465. Ray Qartomy ended up fifth and won $144,595, while Jonathan Abdellatif from Belgium ended up in last place at the final table, winning the sum of $110,225. This win was the highest ever by Stepuchin, as he has managed to surpass the score of $149,220 that he managed to win when he topped the 2018 Larry Flynt Grand Slam of Poker Quantum #7: $375 NLH.